Today morning I am searching for movies, plays, sports etc., where I can spend my time for the post noon activity. My mom, she is not interested in movies, only fixed to cartoon movies. I thought of make her mind to join with us. 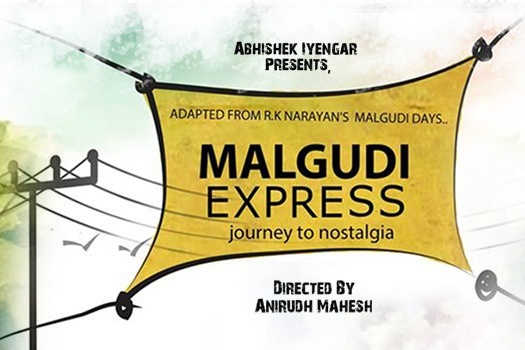 Initially I thought only for sports, then checked the plays, the name Malgudi Express catchy for me, also doing justice for the cause of bringing my mom to the play. Mom and dad are little hasty, later made their mind and we went to the location very early. Kengal Hanumanthaiah Hall, bit famous arena, where lots of plays, music and workshops taking place. My wife and myself went to Ramanjaneya temple to get a vivid darshana of lord Hanuman which is next to KH Kala Soudha. Then the queue starts to get the tickets for play, I saw a queue getting strong and widen up. Organizers get it to the pitch started controlling the crowd who are attending the play. I saw all the group of people, you can split up with people who know about Malgudi days and people who don't know about it. Its like a family gathering, instantly I thought that, all of them are my relatives. Malgudi is not the place, its the emotion, feelings, our culture, our way of doing things, innocent expressions you can add more if you saw this play. Malgudi, is that Lalgudi, Basavanagudi or Magadi & Malleshwaram, people care about this place name more than a book content. Wish I had a book name like that! Play started, person who started explaining about Malgudi days sorry 'Malgudi Express' his hair's side burns remembering me somebody whom I know very much. I need a clarity on the character whom he played. If somebody helping me, that could be great. Malgudi that old village, they definetely scored the marks when we have the flower seller, beggar, cloth merchant, ground nut seller, Seth ji, visitor, even astrologer, tried to provide immense and I told myself, 'Oh that! Malgudi'. Twist and turns of astrologer story. Easwaran made me cry on the floor, his imaginary horse still riding in my memories. That Gundappa, who given the plan to crossword and he escapes from the cursing wife of Ramarao, who had a tragic downfall by his business. That's the time, characters who made the audience rolling on the floor moment. Malgudi station, which got two trains for that mythical platform, which had only three characters, one character never got woke up. The guest character carrying something, which rolled by the towel. The mutton price hike up and the goon who has the vengeance on such community. I like the director of this show, because, he stood up for this script and never bend down to any rules. He delivered this story with lots of guts. Mr. Iyer tackling the goon is awesome, turned up by telling the goon, that he can give 1000 rs. for such doctor who cure the illness by the hit given by him. I worship that kind of tantrum. Small characters also made big impact, light arrangements, music, poster are picture perfect. I can say there is lot many to come in near days. People are already started admiring the talents of theater artists. This play is houseful, I can see lot many people gathered to view the glimpse of Malgudi days. I hope many more Malgudi Express come to our Bangalore platform.